Named after Indiana's first US senator, Noble County was formed in 1836, just eight years after the first recorded white settlers arrived and 20 years after Indiana's formation. Settlements grew with transportation: a trail from Fort Wayne became the now-historic Lincoln Highway; the Sylvan Lake dam, built to supply a proposed canal, attracted author Gene Stratton Porter; and railroads arrived. Each time the population grew and shifted until the citizens voted to place the county seat in "The Center," the geographic center of Noble County. 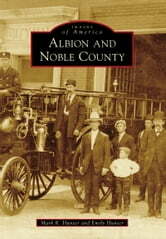 Soon, Albion occupied the space, making it the smallest township in America. With 117 lakes, the Elkhart River, a state park, and numerous historic sites, Noble County became a destination for tourists, while Albion's historical downtown area, centered on a century-old courthouse in a town carved from wilderness, stands in the center of it all. Dr. Fred A. Engle Jr.